Has the importance of learning English phrases and expressions ever been brought to your attention? If you’ve been following my blog for a good while, I’m pretty sure you’re familiar with the concept of natural fluency acquisition via English phrases and idiomatic expressions. If, on the other hand, this is the first time you’re visiting my blog, let me explain to you in simplistic terms why idiomatic expressions are very important to you as an English student. Now, let’s take today’s phrase – BROUGHT TO MY ATTENTION. Imagine yourself having a conversation with someone, and during that conversation you want to say that something has been brought to your attention, in other words – something has been pointed out to you. 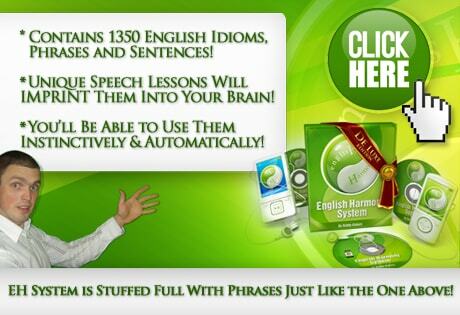 If you conjugate the verb “to bring” every time you speak and you create the sentence from scratch in your head while speaking – BROUGHT TO MY ATTENTION – the resulting speech is going to be somewhat slow and hesitant. If you learn the entire sentence off by heart, however, you can produce it without any hesitation whatsoever; you just recite it like a poem – BROUGHT TO MY ATTENTION! Well, here’s the deal – there’s a big difference between sophisticated lingo and idioms such as “steer clear of”! Pretty much all the idioms I’m publishing on this blog are made up from SIMPLE words whereas sophisticated language tends to be comprised of longer, Latin based words: http://englishharmony.com/sophisticated-vocabulary/ Notice I just used “comprised of”? That’s way more sophisticated than “made up from”! Yes, idioms will take sometimes a big LONGER to say out loud, but I can only see it as a good thing – you’ll be able to say something more thus sounding more native-like. So basically there’s a distinction between sophisticated language and idiomatic language – at least in my book. The former one is more formal whereas the latter one is more down to earth and conversational. actually i was serious ,but its not like its my saying , but often and then foreign English speakers accuse me (hhhhh) that i overdo using sophisticated words or idiom ,, hhh, odd !!! it is been brought to my intention that using idioms when speak to foreign English speaker in particular is gonna to set you in uneasy situation with them. and they might be ask you “why are you using sophisticated phases ,speak naturally .hh hh?